The Boxing Day murder of Pc Ian Broadhurst left a community in shock and a police force determined to track down the gunman. 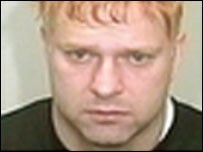 The dramatic manhunt for David Bieber, 38, began with an armed raid on his flat in Leeds and ended at a Gateshead guesthouse just a few days later. In between, members of the public on the look out for the US-born nightclub doorman flooded police with calls. Sightings convinced detectives they were on the trail of the killer. Bieber was sitting in a stolen BMW outside a betting shop in Oakwood, Leeds, on 26 December 2003 when he was approached by traffic constables Ian Broadhurst and Neil Roper. Believing the car was "parked suspiciously", they had checked the number plate, discovered it was false and asked Bieber to accompany them to their car. Although he was calm and cooperative, the officers had called for back-up because they had an "uneasy" feeling about the man now sitting in their back seat. Cornered, and unable to risk arrest because of his wanted status in his native Florida, Bieber pulled out a 9mm handgun and shot Pc Broadhurst at point blank range in the head and abdomen. Other shots were fired at Pc Roper, who was injured, and the officer called to assist the pair, Pc James Banks. He miraculously escaped injury when a bullet ricocheted off his police radio. Bieber escaped down Dib Lane, shooting indiscriminately as he ran, before stealing a car at gunpoint to make his escape. Pc Broadhurst died shortly after being taken to hospital in Leeds while officers maintained a vigil at the bedside of his injured colleague, Pc Roper. Det Supt Chris Gregg, the man charged with leading the hunt for the killer, later emerged to face the media. "To say that everyone in the force is shocked and staggered is a huge understatement," he said, vowing to track down the person responsible. With numerous witnesses and a description from Pc Roper before he entered surgery, officers were able to release a good description of the man they were looking for - an American accent making him distinctive. The description was recognised by Denise Corbally as her ex-husband, Nathan Coleman, who had been working as a nightclub doorman in Leeds. Nathan Coleman and David Bieber were of course the same man. The green Rover car that Bieber escaped in was another clue to his identity after it was reported abandoned outside his flat in Springwood Road, Leeds. Armed officers swooped on Sunday 28 December. It later emerged that he was seen there at 1800 BST on Boxing Day - two hours after the shooting. Det Supt Gregg addressed a news conference early on Monday 29 December to reveal that detectives wanted to talk to Nathan Coleman - Bieber's assumed name - "as a matter of urgency". "I have to reiterate that we are looking for an extremely dangerous man and it is vital that we trace him as soon as possible," he said. Sightings quickly emerged and police began to track his movements. Despite the nationwide hunt, detectives believed he was still in West Yorkshire with him reported in Bradford the day after the shooting and Brighouse two days later. By now, it had been established that Bieber had shaved off his distinctive moustache and more sightings emerged. A potential breakthrough came on 30 December when a flower seller at York railway station rang police to say a man matching Bieber's description was standing on the platform. Armed officers swooped, but despite a three-hour search of trains, platforms and buildings they failed to find their man. But if he was there, it appeared he was heading north. The real breakthrough came later that day at 2335 GMT when a receptionist alerted police to a suspicious man staying at the Royal Hotel in the Dunston area of Gateshead. Armed police swooped at 0225 GMT on 31 December finding Bieber asleep in his room. He had dyed his hair orange and was in possession of thick, black glasses to disguise his appearance. 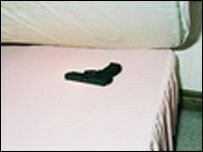 More worryingly, he had a semi-automatic pistol, loaded and ready to fire, hidden under the mattress. Senior investigating officer Det Ch Supt Chris Gregg said the best news he had ever received was when he took a call at 4am on December 31 2003 from Northumbria Police, saying they had arrested Bieber. Speaking after Bieber was sentenced to life in prison, he said: "I fear that a lot of other lives would have been lost on Boxing Day. This was a killer on the run." But he said the investigation into Bieber was not over: "The investigation into this man is still far from complete. "What has he been doing these last seven years?" Mr Gregg urged members of the public to study pictures of Bieber on the television and in newspapers and ask themselves what he might have been doing during the last seven years. He said: "We ask people to look at David Bieber again. He may not have been using David Bieber or Nathan Coleman, he had any one of a number of identities." Speaking outside Newcastle Crown Court, John Sampson, assistant chief constable of West Yorkshire Police, branded Bieber an enigma. He said: "He remains an enigma and he remains a mystery. Time may help us unravel this mystery." Mr Sampson praised the determination of all the officers involved in the inquiry and the prosecution team in bringing Bieber to justice. He added: "Were it not for all these people, David Bieber might still be at liberty to pose a threat to society."